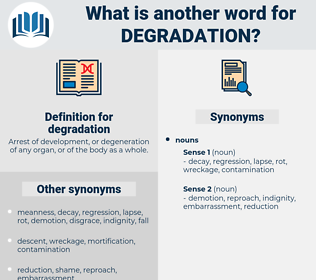 What is another word for degradation? Arrest of development, or degeneration of any organ, or of the body as a whole. decomposition, erosion, depletion, destruction, disintegration, defacement, downgrade, biodegradability, pollution, spoilage, deprivation, dissipation, Weathering, depreciation, downturn, degenerative, disruption, deconstruction, reduction, contamination, decrease, weakening, lowering, regression, degradability, loss, demolition, recession, escalation, pauperization, impairment, decline, disrepair, pauperisation. downgraded, damaged, destroyed, worsened, eroded. decay, downgrading, impoverishment, devastation, aggravation, exacerbation, deforestation. elevation, honor, morality, increase, improvement, approval, admiration, promotion, esteem, upgrade. enhancement, accrual, growth, restoration, righteousness, evolution, addendum, heightening, goodness, addition, flourishing, augmentation, ascent, boost, accretion, upswing, revitalization, advancement, increment, blossoming, flowering, renewal, supplement, raise, development, virtue, gain, rise. Their position is sufficiently unpleasant without our adding to the degradation of it. But she had gone home, and at any rate I escaped that degradation. decoration, discretion, dessert wine, dissertation, desertion, desecration, dishearten, dacrydium. bastardisation, profanation, constipation, demoralization, corruption, barbarization, animalisation, brutalisation, impairment, dehumanisation, popularisation, stultification, abasement, humiliation, subversion, brutalization, animalization, demoralisation, deadening, barbarisation, vulgarisation, dehumanization, vulgarization, bastardization, popularization.